In 1970, Sunvil launched its holiday programme to the Mediterranean island of Cyprus. Whilst the island has developed over the decades our passion is undiminished. Our desire today is, as it was 48 years ago, to introduce our guests to the ‘real Cyprus’; an open air museum and a fascinating and diverse place to visit. On our 7 night fly-drive holiday to Paphos, Nicosia and the Troodos Mountains we will take you from Paphos to the island’s capital and to the green hills, wild flowers and sleepy villages at the island’s heart. On your journey you will encounter local residents who cannot wait to share their stories with you and to provide recommendations for your travels. On arrival at Paphos Airport you will be transferred to the Axiothea Hotel in Paphos. The hotel is located in Pano Paphos (Upper Paphos) which is the old town. Do try one of the local tavernas. After breakfast, you will meet with Angela our Cyprus manager. Angela lives in Paphos and there is little she does not know about the town, where best to eat and what to do and see (far better than a Google App). We have also included a private walking tour with a licensed guide of Paphos Town and its archaeological sites (entrance payable locally) to enable you to scratch under the surface of the resort – There is much more to Paphos than a busy tourist hub, believe us! Free time in Paphos. Opportunity to drive to the Hellenistic and Roman city of Curium and the UNESCO World Heritage site of Palea (old) Paphos and Aphrodite's Temple. Alternatively, head to the beach for a refreshing swim. After breakfast, your hire car will be delivered to the hotel. 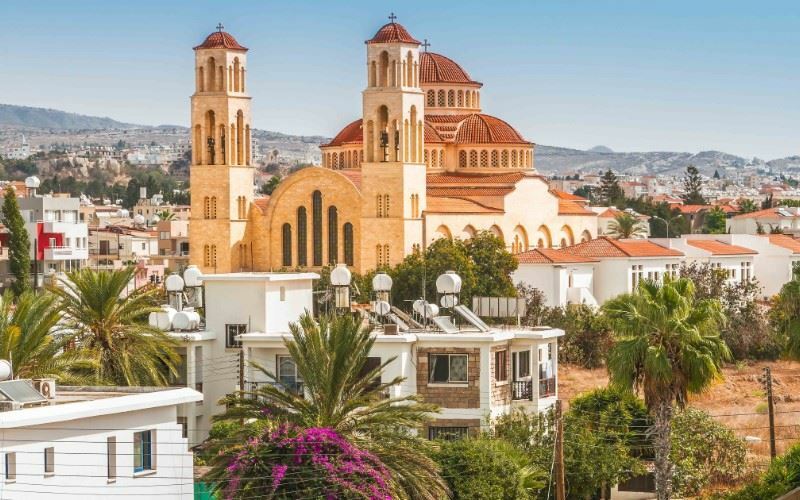 Your destination today is Nicosia, the capital of the island and surprisingly one of the most underrated places to visit on the island. The old town of Nicosia, neglected for many years, has been extensively renovated and, in our opinion, is the place to be on the island. The old quarter buzzes with cafes, tavernas, bars and restaurants. There is much to see in the last divided capital in the world. If you happen to be in Nicosia on a Thursday (at 10am) there is a free walking tour of the capital organised by the municipality, giving an overall picture of the city within the walls and how it has evolved through the centuries. Additionally, Nicosia has six art galleries and 15 museums. The Cyprus Archaeological Museum traces the long history of civilisation on the island and is a must. The Venetian fortifications of Nicosia were considered the prototype of renaissance military architecture, are very well preserved and one of the main features of the city. After breakfast in Nicosia, drive to Kakopetria in the heart of the Troodos Mountains (63km - 1 hour). The Cypriots are justifiably very proud of their very heavily pine and cedar forested mountains. The Forestry Department is one of the most respected in the Eastern Mediterranean and the Middle East. The mountain villages are much the same now as they were 30 years ago and development has been minimal. Just driving through the mountains is a pleasure in itself. Open the car windows and smell the pine scented air. The Troodos mountain region is home to one of the largest groups of painted churches and monasteries of the former Byzantine empire. Ten of these churches are on the UNESCO World Heritage List. The Medieval church of St Nicholas Of The Roof is on the outskirts of Kakopetria and contains important examples of 11th century iconography. There is much to see and explore in the Troodos Mountains and Mount Olympus rises to a height of 1,952 metres. This is ‘The Green Heart of Cyprus’. In the winter you can ski and in the summer the mountains are delightfully cool. There are many well marked trails through the mountains and picnic areas to stop and rest. A walk through this landscape rejuvenates the senses. After breakfast, drive to Paphos or Larnaca Airport for your return flight home.